When German scientists were conducting micro-gravity experiments on China's recoverable satellite in the 1980s, Chinese space engineer Tang Bochang was busy solving technical problems, while carefully keeping Chinese secrets. Tang joined the China Academy of Space Technology in 1970, the same year China launched its first satellite. He has participated in the development of returnable satellites, with China's first successful launch in 1975. Soon after, China started to open its space missions to the outside world in the wake of its reform and opening up. "At that time, only the United States, the Soviet Union and China had mastered the technology of returnable satellites, and the International Space Station was yet to be built. So both France and Germany asked to use China's returnable satellite to carry out experiments," Tang recalled. "They were curious about China's space technology, but also kept their secrets from us," he said. In delicate circumstances, China and Western countries began collaboration. Despite their respective concerns, cooperation gave each side more opportunities for space exploration. In the early 1980s, China aimed to develop transmission-type remote sensing satellites to obtain real-time satellite images. At that time, China was still relatively backward and hoped to collaborate with other countries to develop such kinds of satellite. But the United States and Europe, which had mastered the technology, were reluctant. Eventually, China found a partner: Brazil, also a developing country. In 1988, the two countries signed an agreement to jointly develop the China-Brazil earth resource satellite. They shared the cost, and separately developed its systems. Both sides had advantages and were highly complementary. Ma Shijun, former head of the project, recalled the biggest obstacle to cooperation was language. Engineers often had to gesture with dictionaries in hand. The distance between the two countries also made it difficult. "But the technicians got along well, giving full play to their own advantages. We learned international practice in satellite development, and the technicians broadened their perspectives," Ma said. "Both sides reviewed the documents and reports, which was a double check, reducing the possibility of mistakes." In 1999, the first China-Brazil earth resource satellite was successfully launched, giving each country their first transmission-type remote sensing satellite. It was rated one of the top 10 scientific and technological advances of the year in China. It was the first satellite jointly developed by China and another country, and set a good example for cooperation among developing countries in the field of space technology, and was praised as a model of "South-South cooperation". The cooperation has lasted 30 years. The two countries have sent four satellites into space. The resolution of the images has gradually improved. Data from the China-Brazil earth resource satellites are provided to developing countries for free. The satellites have also helped monitor disasters such as forest fires in Australia, floods in Pakistan, and an earthquake and tsunami in Japan. In 2005, China's two space science satellites joined with the satellites of the European Space Agency to complete the world's first joint, synchronous six-point exploration of the earth's space, obtaining important data. It was the first science satellite cooperation between China and Europe. Like renowned space projects such as the Hubble Space Telescope and the Spirit and Opportunity Mars rovers, this project was awarded by the International Academy of Astronautics. With its growing economic and technological strength, China has become a big and important space player, encouraging more countries to take part in its space programs. Scientists from China and other countries are working together to probe the universe. One of the detectors on China's Dark Matter Particle Explorer, launched in 2015, was jointly developed by scientists from China, Switzerland and Italy. China's space lab Tiangong-2, launched in 2016, carries a gamma ray polarization detector developed by scientists from China, Switzerland and Poland. China and Italy have developed a satellite to observe earthquake-related electromagnetic information. A satellite developed by China and France will be sent into space soon to study ocean winds, waves and climate change. The two countries are also working on an astronomical satellite. A Sino-European joint mission, the Solar wind Magnetosphere Ionosphere Link Explorer (SMILE), will be launched in 2021. The enhanced X-ray Timing and Polarimetry (eXTP) satellite to explore still mysterious celestial bodies, such as black holes and neutron stars, which China plans to launch by 2025, has drawn scientists from more than 20 countries, including Italy, Germany, Britain and France. China's Chang'e-4 lunar probe, set to be launched in December this year and expected to become the first probe to soft-land on the far side of the moon, carries detectors from Germany and Sweden. China is welcoming other space agencies to participate in its follow-up lunar exploration programs and jointly build a research station on the moon. Yu Dengyun, deputy chief designer of China's lunar exploration program, said international cooperation has become common in space exploration, as the costs, challenges and risks of any space project are huge. "If we can pool global wisdom and share the risks and costs, we can achieve the goal of space exploration faster, which benefits everyone," Yu said. China announced in May that it would welcome all member states of the United Nations to cooperate in and jointly utilize its future space station, which is expected to be built around 2022. "The China Space Station (CSS) belongs not only to China, but also to the world," said Shi Zhongjun, China's Ambassador to UN and other international organizations in Vienna. "Through the vehicle of the CSS, we would like to build a model of sincere mutual beneficial cooperation among countries in the peaceful exploration and use of outer space." Guided by the idea of a shared future for mankind, the CSS will be a home that is inclusive and open, a home of peace and good will, and a home of cooperation for mutual benefit, he said. Simonetta Di Pippo, director of the UN Office for Outer Space Affairs, welcomed the move as China stands ready to share its "state-of-the-art space program." Li Guoping, a spokesman for China National Space Administration, said international cooperation and exchanges are necessary to explore outer space. For instance, international consultations are needed to allocate satellite frequencies and orbital resources, as well as formulate outer space traffic rules. 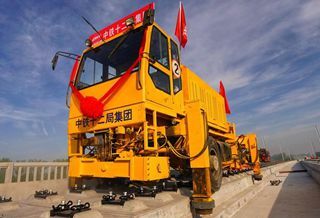 China is advancing construction of an "information corridor" for countries along the Belt and Road, and a remote-sensing satellite constellation for the BRICS countries (Brazil, Russia, India, China and South Africa), Li said. The earth is a grain of dust in the universe. Many astronauts and astronomers have expressed the view that those who see our blue planet from space have a deeper understanding that humans must learn how to coexist on it.